Let’s be honest—it’s pretty rare to find a child who LOVES to brush their teeth. More often than not, brushing feels like a chore, a hassle, or even World War III. But with a little brainstorming you can easily transform your child’s attitude. Instead of dealing with frowns, furrowed brows, or tears, you can make simple changes that will produce smiles, laughter, and healthy habits for kids learning to brush their teeth. Music is powerful and can affect everyone’s mood, no matter their age. Instead of brushing in silence, turn up your iPod and let your little one shake their hips or bounce to the beat as they brush. Not only will music lighten the mood, but it has the added bonus of creating a time limit to brush to. Choose a song that will last a couple of minutes and tell your child that they have to scrub their teeth until the song is over. You’ll be amazed at how clean their smile will get! For younger ones, turn brushing time into story time. They can begin brushing “once upon a time” and rinse their toothbrush when you reach “the end.” Stories are a great way to entertain them and make the seconds tick away more quickly. Just make sure they stay on track during story time and that they brush their smile from top to bottom. It’s true what they say: there’s an app for everything—even for brushing! While the list of brushing apps can be long, there’s an app gaining popularity as well as rave reviews. Developed by a dentist in the UK, Brush DJ provides a fun, FREE way to guide older children while brushing. The visual display will show your child where to brush while playing 2 minutes of music from your device’s music library. And if you like gadgets with added bells and whistles, this app has the additional feature of programming customized reminders about brushing, flossing, replacing your toothbrush, and even visiting your dentist. Three cheers for that! Feeling inspired to spice up your routine? Give it a try. 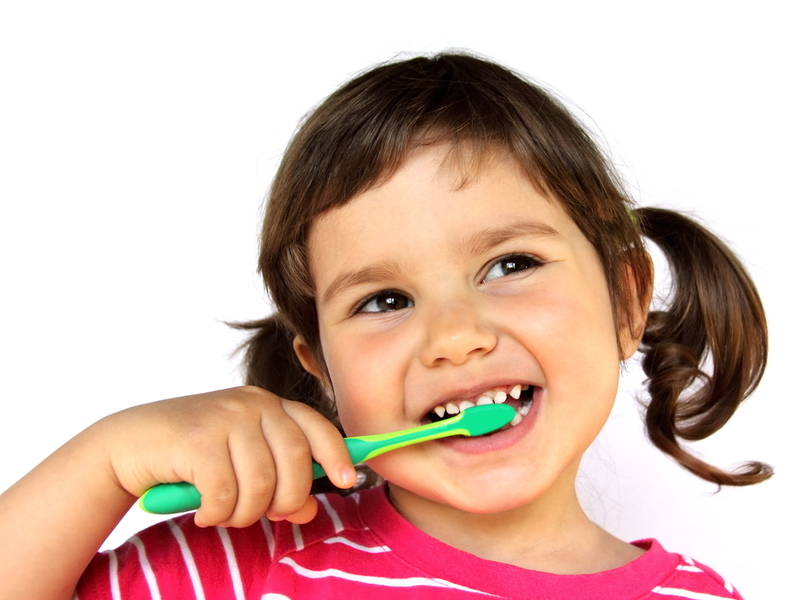 You’ll find that brushing routines will not only become more fun for your child but more enjoyable for you too! And don’t forget to schedule a visit with a pediatric dentist at least twice a year to kickstart even more healthy habits for your child!